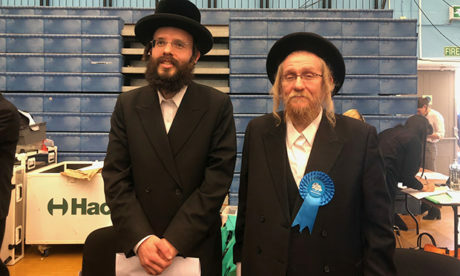 Cllr Aron Klein (right) on his election as councillor for Stamford Hill West. Photograph: Hackney Conservatives. A Conservative councillor is refusing to eat the supper provided to ward representatives at council meetings in protest at parking tickets given to residents on New Year’s Day. Cllr Aron Klein (Con, Stamford Hill West) called for the tickets to be ripped up after multiple drivers were fined on 1 January due to parking restrictions in force for an Arsenal match at the Emirates Stadium. He has asked not to be served dinner at the Town Hall, claiming that the food would be paid for with “stolen money”. The row today escalated as Kim Wright, Hackney’s group director of neighbourhoods and housing called the councillor’s claims “absurd” and “based on a false premise” in emails seen by the Local Democracy Reporting Service. Writing to Wright, Cllr Klein said: “You did the right thing. You put up five signs on Lordship Road, telling drivers you will give parking tickets on bank holiday event days on single yellow lines. “However since this signage wasn’t there on New Year’s Day, I demand you refund the parking tickets for the families who came to visit the nature reserve. The Town Hall has said that 19 tickets were issued to vehicles on Lordship Road on 1 January for breaching event day restrictions, including 14 for parking on single yellow lines. Wright has responded that the signage put up on Lordship Road and the tickets served were all legally compliant, and that the additional signage referred to by Cllr Klein was put up in order to “make it even clearer to drivers where they can park on future match days” rather than because the tickets had been served incorrectly. Wright said: “As I have replied to you on numerous occasions now in relation to this matter, the penalty charge notices (PCNs) on 1 January were served in accordance with our bank holiday and event zone policy, which has been in place, and has been being legally enforced, for some years now. “There is no money to pay back and your inference that the money from these PCNs is somehow ‘stolen’ is absurd. I will not be cancelling the PCNs issued on 1 January as they were all issued legally. It is not clear whether Wright’s email was intentionally shared with the Local Democracy Reporting Service.